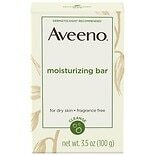 Shop Aveeno Active Naturals Moisturizing Bar for Dry Skin (3.5 oz. )3.5 oz. $349$3 and 49 cents$1.00 / oz.